Byron holds a beast of a Chinook salmon from our outing on the Pere Marquette river. 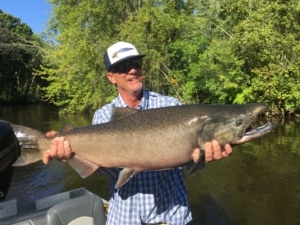 The Muskegon river fishing report for September 22, 2018 in the Newaygo, Michigan area is about the cooling weather, onset of the “fall” season and beginning of our annual fall Salmon and Steelhead seasons. With summer like conditions giving way to more typical fall weather, we’ll be seeing a lot happen in the coming week+, which will bring fall run Chinook salmon up the Muskegon river on their annual spawning run. Not far behind them will be the highly anticipated arrival of fall steelhead, which we’ll fish up to the New Year. Click HERE for current weather and forecast for the Muskegon, Michigan area. With both fly fishing and light spin tackle equipment, we’ll chase some salmon around through late October and then switch to fall steelhead for the remainder of the year. Having seen some of the larger salmon that we’ve seen in recent year while guiding up on the Pere Marquette river between the Ludington and Baldwin areas, we’ll surely see some pretty big steelhead in the months ahead. Not to be left out are lake run Brown trout, which typically show up around mid to late November, but river conditions really play an important role in their arrival. I will be on either the Pere Marquette or Manistee rivers through early October, then switch to the Muskegon river for the rest of the year to wrap up our Great Lakes big game season. Present water levels on the Muskegon river are in the 1,300 cfs range, pretty good considering we had low water for much of the summer. Click HERE for current Muskegon river water flow data.